Kristy got in first yesterday and requested a purple holo gradient, and it also seemed to be a popular choice from all the comments I received, so I am very happy to show my my purple holo gradient. This is actually my second attempt at doing a purple holo gradient. 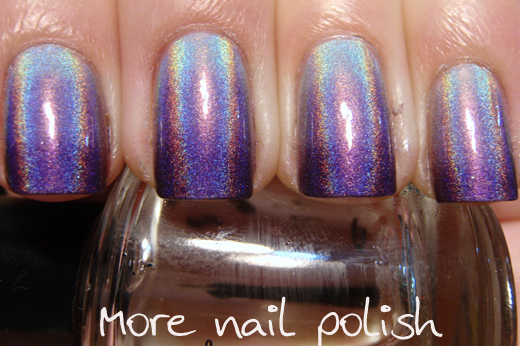 I learned last night that not all holo polishes are created equal when it comes to using them for gradient manis. My first effort started with a base of Ozotic 509, the silver holo. I then tried sponging on Ludurana Supremo as the mid shade and Hits Dionisio as the dark shade. After three sponge applications of the colours, I could barely see the colour change on my nails at all. By that stage my nails were getting thick and sticky and I didn't want to be wasting much more of my little Hits bottle trying to get a more saturated colour. I don't know why those polishes didn't sponge very well, as they seem quite saturated in the bottle and as a regular mani. After my failed first attempt, I pulled out some polishes that I knew would work perfectly, the China Glaze OMG collection. I did a base with OMG, the mid shade is IDK and the dark shade is LOL. 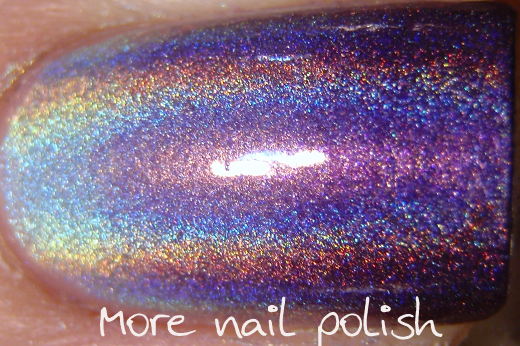 This time, whoa - I love how all the tiny linear holo particles line up. Had enough holo gradients yet? Wow thats soooooooo pretty! Never though of a holo gradient! Yep, this is definitely my favourite!! 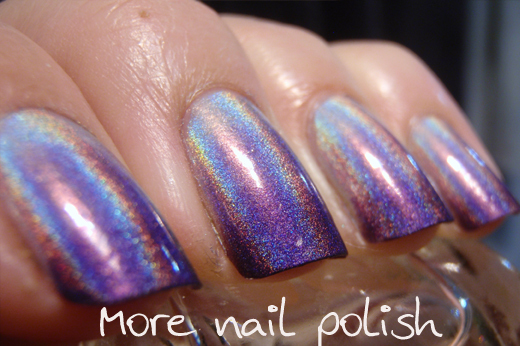 That second to last photo look so cool, looks like a multichrome shift rather than gradient, love it! You got do red, red, red next! Love these gradients! I certainly haven't had enough. Wow this is so perfect! The colors blend perfectly! I am drooling over this! I can never get my gradiants too looks so seamless. I'll never have enough holo! 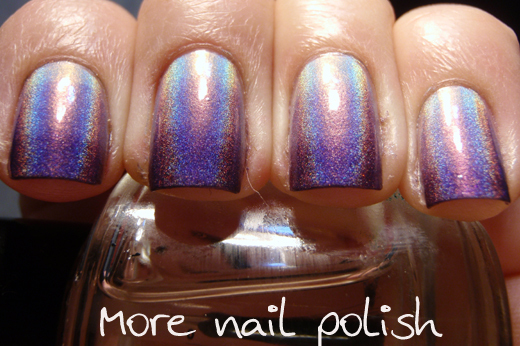 This is my favourite gradient mani of yours. Love it! 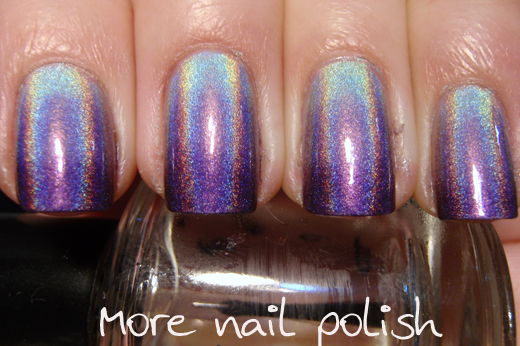 Ooh, the holo and the gradient together--it's so buttery smooth and pretty! That's as perfect a gradient as I've ever seen. Stunning! Lovely - Like you want to be careful with your use of your HITS colors, I am equally as CAREFUL how I use my OMG's - most are next to impossible to replace - especially OMG. I wish I had been looking to China Glaze when they came out...but I was only watching OPI's which was all there was to buy in my area other than drugstore lines. Hun you are on a major posting roll!!! I read my RSS feed when I'm *cough-at-work-cough* so over the weekend my feed fills up. This morning I'm looking though my feed and WOW your posts are amazing!!! 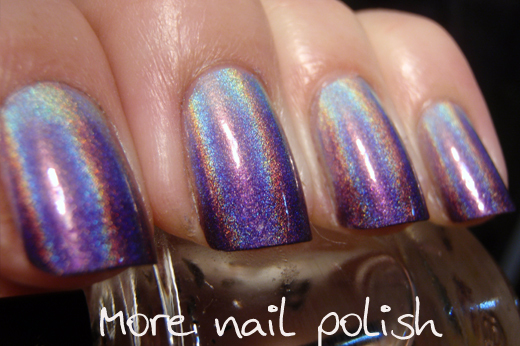 I think this is your best holo gradient so far, the liniar holo effect is still so visible, wow, great job!!! Oh my gosh. 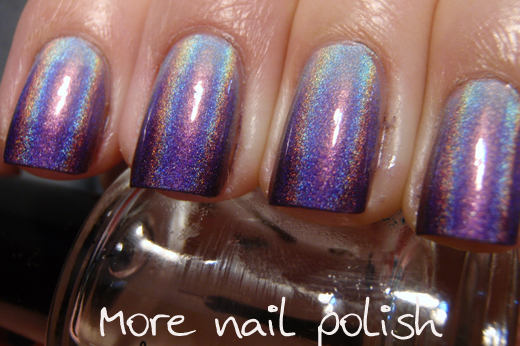 I love purple holos and it looks even more amazing in this gradient. So much love.